"Updates include some changes to paintings, a fourth song for the nether, some new mob sounds, and a lot of new fun and excitement for the End in the form of a long awaited request, including a new surprise when you leave the End for the first time. Be sure to have your music volume turned up the next time you go to kill the dragon or travel the nether rails! And remember to sleep regularly :)"
Don't forget about the newsletter! Did you know that we have a monthly email newsletter? It's true, and you can subscribe to it for some exclusive content! Every month, we send out an email to all those who have chosen to received it. Found within is a recap of the major news items for the past month, a summary of the ongoing events, a new render, an interview with an established player, and more! As a sample, here is this month's newsletter, which was sent out yesterday. Interested? You can subscribe today to make sure that you don't miss the next issues! As announced before, the new version of Cimmeria is now live! The spawn town, Aditus, has been migrated over while everything else is new. Note that this world features a nice variety of oceans and is a great spot for fishermen and coral hunters! At the same time, Tasmantis has been retired after serving us well for a few months. Farewell! The Grindatron is back at long last! This challenge was popular in its first iteration, and I was looking forward to bring it back. Like many other things, it needed a partial rebuild to work properly under Minecraft 1.13. I've worked on that over the past month, and here's the result! The full details are below, for new and returning players alike. The Grindatron is this month's challenge, accessible from the lobby. It takes place in its own world, with a fully separate inventory. 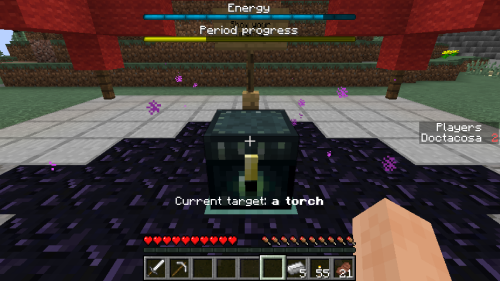 Every few hours, a new goal happens in the form of a block or item that needs to be provided at the spawn point. Provide the item in time, you get points! However, each action you perform (moving, digging, placing blocks) drains your energy, which is limited! Every four hours, a new target is given. For example, "2 x bread", "64 x dirt", or "1 x gold pickaxe". Your goal is to obtain this item and place it in the enderchest that's located at the spawn point, near coordinates 0, 0. If you do it right, you'll get a confirmation and can either continue freely playing to gather more supplies, or wait until the next target appears. You can get a confirmation of the current target by entering /target. When you're ready, drop the item(s) that are part of the current target in the enderchest, in a single stack. If you're correct, the items will disappear and you'll get a confirmation. Be careful: any and all objects placed in the enderchest at that time will be removed, including those that are not related to the current target! Once you run out of energy, you'll move way slower, won't be able to break some blocks, and all around will be exhausted. Don't get caught in the open when that happens! New limitations apply: drinking milk buckets is no longer possible when exhausted, so you can't clear the effects temporarily, and fishing will no longer return items. If you break your streak, you'll restart from day one. Staying online doesn't count, as well as accessing other worlds: you need to leave and rejoin the Grindatron for your presence to be counted. For the initial round, I created all the targets manually. This time, I've prepared a system that automatically generates them on the fly, with a wider variety. Nearly all items are possible as targets, but I've assigned each one a rarity value to ensure that things like "64 x Nether star" never happen. "64 x stone" is possible, though! If you believe that one of the targets generated is impossible (for example, "64 x snow balls" since you can only stack these up to 16), please let me know and I'll make the necessary adjustments! Each succesfully completed target will net you one Merit Point, giving you a chance to increase your score very quickly! Remember that we've got new uses for the points, too! This new challenge will last for the entirety of March. Have fun!